In 2018, we surveyed 795 physical therapists who graduated between 2012 and 2017 to answer several questions we had about the industry, the job outlook for new grad PTs, and the future of the profession. We hope that the 2019 report, with over 17 charts and graphs, expands your understanding of the job outlook for new grad PTs! How difficult was it finding your FIRST physical therapy job? Did you secure your job before you graduated physical therapy school? From the time you graduated with your diploma, how many weeks did it take to accept your FIRST physical therapy job? How many facilities have you worked for before your current position? Today, on average, how many patients per day do you see? Do you feel that the industry thinks new grads are less productive than they actually are? What was your starting annual salary before tax and benefits for your first job? Does your student debt motivate you to work harder, longer hours, or less desirable days? Do you feel that physical therapy school trained and prepared you better for patient care than a physical therapist who graduated over 10 years ago? Do you feel that you have skills and abilities today that could help you grow and maintain a practice that the senior therapist doesn't have? Do you feel that as a new grad you are more motivated about your job than physical therapists who have been in the field for a long time? We got answers to these questions, and more, in our 2018 new grad physical therapist survey! You might be shocked at how PTs responded! Finding that first job can be a challenge—particularly based on the responses to our last survey, which suggested that PTs didn't think graduate school prepared them well for the realities of working in healthcare. Whenever we ask PTs what they're most worried about in their careers, the biggest answer is DEBT. That's why we were curious about starting salaries: what are PTs getting paid right out of school? What skills are physical therapists bringing to their first jobs? When bringing on a new employee, a practice owner's or hiring manager's first question should always be: what will this person add to my practice? The good news is that with PTs, the answer is "A ton!" How well does PT school train physical therapists for their first PT job? How confident are physical therapists in their clinical skills? How many PTs think they're as good or better at crucial aspects of their jobs compared to more experienced PTs? These are important questions, because they determine so much about a new grad physical therapist's first job: what you look for, what you accept, and ultimately, whether or not you'll feel fulfilled in that position. How many patients per day do new grad PTs see? For many PT settings, productivity is the name of the game. That's why we wanted to know how many patients new grad PTs saw on average. Are new grads able to keep up with productivity requirements in their settings as well as experienced practitioners? 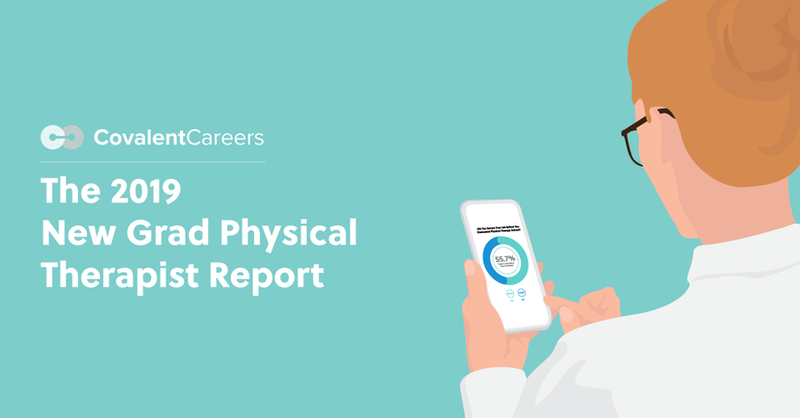 The 2019 Physical Therapist Report is 17 pages of charts and analysis from CovalentCareers. The Bureau of Labor Statistics reports a substantially higher job growth in physical therapy than the national average, and the APTA has projected a corresponding shortage of PTs in the workforce. As the US population ages—according to the US Census Bureau projections, by 2030, 21% of the US population will be over 65—more therapists will be needed to assist a growing population determined to age in place. We put this report together because our primary goal is and always will be to provide job placements and mentorship to healthcare practitioners, particularly physical therapists, and we can’t do that without understanding the industry-wide changes that are shaking up the job outlook for PTs across the US.